Stellar Four: It's Brave Week at Stellar Four! It's Brave Week at Stellar Four! 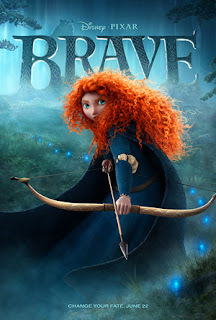 Pixar's new film Brave is being released on Friday, and we at Stellar Four are bouncing on our toes in excitement — mostly figuratively, but occasionally literally, too. Brave tells the story of Merida, a Scottish princess and a skilled archer whose attempts to carve out her own path bring chaos to her kingdom. Here's why we're so stinking excited: It's A) a new Pixar movie B) with its first female lead who C) has amazing curly red hair and D) lives in glorious Scotland. Be sure to check our blog all week for posts on all things Scottish, Pixar, princess-ey, redheaded, and toxophilite (look it up!). Are you eagerly anticipating this movie as much as we are?